Good morning! In case you missed it: I went on NPR's "Weekend Edition" to talk about Shell leaving a Washington trade group. Officially launching tomorrow is Axios Space, your new weekly missive covering the latest in the trends, business and science of space. Below, I share a glimpse of my exclusive column about former Secretary of State John Kerry, and then Ben Geman gets you up to speed on the rest of the news. Driving the news: In an exclusive interview with Axios last week, Kerry laid out the broad parameters of a renewables financing proposal that he said could become a model for other countries in coal-dependent Asia too. The big picture: Vietnam, like the rest of Asia, is where the world’s battle over growing economies and worsening climate change is raging. These nations want cheap power — usually coal — to provide better standard of living for their growing populations. Yet they're under political pressure to back away from coal, given that their heavy use of it is accelerating global warming and worsening local air pollution. 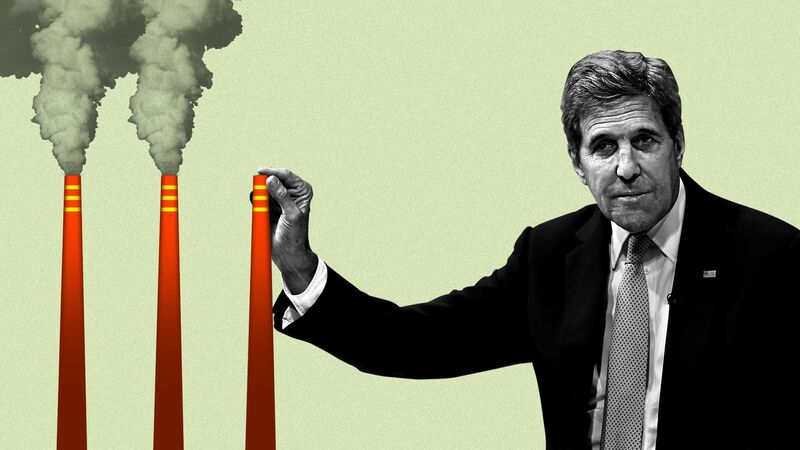 Flashback: Kerry’s history in climate change diplomacy and Vietnam runs deep. He was a leading architect of the 2015 Paris Climate Agreement — which will proceed without the U.S. since President Trump has vowed to withdraw from it. Coal became Vietnam’s biggest electricity source in 2018, surpassing hydropower for the first time, according to preliminary International Energy Agency data. More than 42,000 megawatts of new coal capacity are under development, according to a recently released report by environmental groups. That’s nearly one-fifth of America’s entire operating coal capacity. Where it stands: Kerry’s proposal includes undisclosed private-sector financing for wind and solar along with transmission lines. It also calls for more efficiently using Vietnam’s hydropower and tapping a domestic natural gas field. Speaking of Kerry, his quest to get Vietnam off coal is running headfirst into a power-hungry and growing region. The big picture: The 330 million people in the U.S. consume twice as much electricity as the two billion people living in India, Indonesia, Pakistan, Bangladesh and Vietnam, according to IEA expert Carlos Fernández Alvarez. “That’s six times less people consuming more than double the electricity,” he said. What we’re watching: The State Department is holding a closed-door meeting Friday with Vietnamese officials about its energy sector. A spokesperson declined to comment on its specific focus. Climate: "Royal Dutch Shell announced that it will spend $300m over the next three years to help motorists offset the emissions from their cars, by funding large forest projects in the Netherlands, Spain, Australia, and other countries," the Financial Times reports. Prices: Via Reuters, "Oil prices rose to their highest level since November 2018 on Monday, driven upwards by OPEC’s ongoing supply cuts, U.S. sanctions against Iran and Venezuela, fighting in Libya as well as strong U.S. jobs data." Markets: Per the Wall Street Journal, "It has been a good year for exchange-traded funds focused on the oil-and-gas industry, though investors should be wary of potential pitfalls, analysts say. They note that the 2 biggest ETFs in the sector — the Energy Select Sector SPDR Fund and the Vanguard Energy ETF — are both up more than 16% in 2019. Political Climate, a podcast that tracks the politics and substance of global warming policy, has new partners and wider ambitions. Political Climate was previously a Greentech Media project, and Greentech's Julia Pyper will remain the host, but she's moving into a contributing editor role there and spending more time on the pod. ICYMI, a Friday item in the Axios Future newsletter uses Tesla's disappointing Q1 deliveries to dive into whether EVs can really capture a large share of the mass vehicle market. The big picture: Axios' Steve LeVine writes that people have bought Teslas in droves because they are cool, which is something that other early electric carmakers, including GM, Nissan and BMW, could not claim. Yes, but: The first-quarter plunge in deliveries — following the exhaustion of Tesla's federal vehicle subsidy quota — may suggest that cool only goes so far. What they're saying: One Tesla bear, Gordon Johnson at Vertical Group, is forecasting that Tesla will fail to sell as many cars this year as it projected, reports Business Insider's Arjun Reddy. "Customers want more electric drive choices in different segments, and mainstream customers need better prices and value propositions. Remember that sedans are a tougher sell throughout all of the industry. [Tesla's] Model S & X may also be in need of a refresh." "All automakers are going to be bringing EVs to market in the next few years, whether customers want them or not. I think they will end up being discounted (both because of the tax incentives and just to get people interested) and the question is whether there is a tipping point at which natural demand will take off." Speaking of Tesla, Bloomberg reports: "Fiat Chrysler Automobiles NV is pooling its fleet with Tesla Inc. to comply with stricter European Union rules on carbon-dioxide emissions, in a deal that’s likely to pay the U.S. electric-car leader hundreds of millions of dollars."